Thanksgiving and Christmas is coming. Still looking for suitable gift for your family? What about Kindle, the eReader from Amazon. I think this gift could support positive habit of your family especially reading qualified book from Kindle store. Kindle series : Kindle ($79), Kindle Touch ($99),Kindle Touch 3G ($149), Kindle Keyboard, Kindle Keyboard 3G ($139), Kindle Fire ($199). Amazon has released the newest Kindle serie, Kindle Fire. This is the first colored eReader from Amazon. Before you buy it, better to read Kindle Fire Review from Kindle costumer/user. 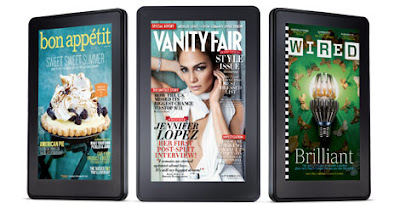 Kindle Fire is Full Color 7" Multi-touch Display embedded with Wi-Fi. This is not only eReader. You also can check email,browse the Internet, maybe play a few games, most importantly, you can read magazines in color on a Kindle. If you consider in price, at $199 the Fire is less than half the price of the Apple iPad, which starts at $499. It is the first tablet from a major company to seriously undercut the iPad in price. System Requirements None, because it's wireless and doesn't require a computer. On-device Storage 8GB internal (approximately 6GB available for user content). That's enough for 80 apps, plus 10 movies or 800 songs or 6,000 books.